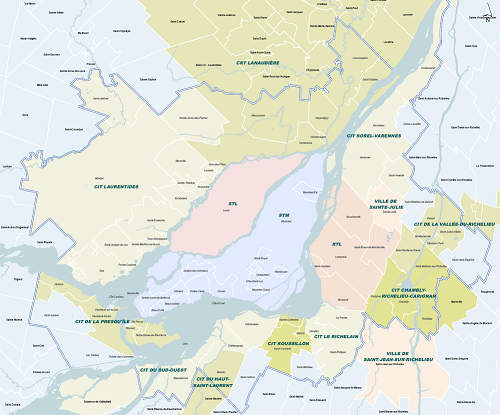 In addition to planning the development of public transit services in the Montréal metropolitan area and acting as prime contractor for the construction of projects such as the recent extension of the Montréal metro to the neighbouring city of Laval, the AMT operates 5 commuter train lines, 1 metropolitan express bus line, 16 terminuses, 85.2 km of reserved lanes and 61 park-and-ride lots (more than 31,300 spaces). Its annual ridership is 18,177,000. To ensure a better integration of transit services throughout the territory of the Montréal metropolitan area, the AMT works closely with the Quebec Transport Department and the 14 transit organizations that offer services on the territory, namely three transit companies (Réseau de transport de Longueuil [RTL], which offers local bus services; Société de transport de Laval [STL], which offers local bus services; and Société de transport de Montréal [STM], which manages the local bus and metro systems on the Island of Montréal), nine intermunicipal transit councils (CIT), one regional transit council (CRT), and one municipality that organizes its own public transit services. The AMT also works closely with the 12 paratransit organizations in the territory. When it was created, the AMT was given responsibility for the metropolitan Montréal area’s commuter train network. Since 1996, when there was only the Deux-Montagnes and Dorion-Rigaud lines in service, the AMT has worked to consolidate and develop the network. Since then, it has added three lines: Blainville in 1997, Mont-Saint-Hilaire in 2000 and Delson in 2001. In 2005, it extended the Delson line to Candiac, and in January 2007, it extended the Blainville line to Saint-Jérôme. 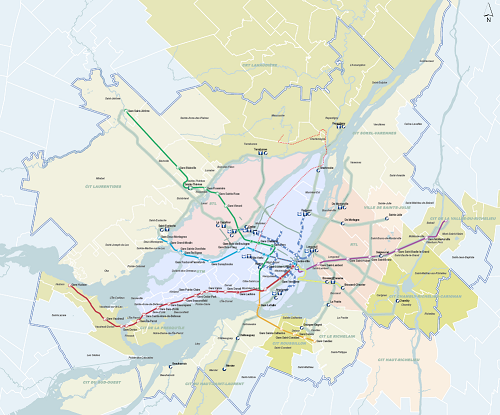 Moreover, in 2006, the Québec government authorized the construction of a sixth line that will serve eastern Montréal and the northeast off-island suburbs (Repentigny, Terrebonne and Mascouche) in the metropolitan area: the Train de l’Est. With 16.6 million passengers (2011), the commuter train system in Montréal area is ranked sixth in ridership in North America, after the New York, Chicago, Boston, Philadelphia, and Toronto regions. The metropolitan bus system constitutes a vital component of the Montréal area’s transit network. With its 19 public transit routes, the metropolitan bus system (RTMA) efficiently connects all the areas of the metropolitan region that are not served by commuter trains or the metro, especially those with a small population. 2.9 million car drivers make use of park-and-ride lots, 25.3 million trips pass through the 85 km of metropolitan reserved lanes, and close to 73 million customers each year use one of the AMT’s 16 terminuses. construction contracts for the completion of the work. The AMT is responsible for planning and general coordination of the commuter train network. Its own employees also perform the following administrative and legal support activities: accounting (payments, audits, budgets), procurement (calls for tenders), communications (promotion, press releases, press conferences), and legal (contracts, legal notices, claims, statements of offence). the AMT engages subcontractors to perform specific tasks related to preventive or corrective maintenance. Managing the RTMA requires the AMT to develop cooperative relationships not only with its delegated managers and its subcontractors but also with various municipal and federal stakeholders such as the municipal roads departments, police forces, The Jacques Cartier and Champlain Bridges Incorporated (JCCBI) and the St. Lawrence Seaway. The AMT currently entrusts the operation of RTMA bus services to the public sector, through negotiation and in the form of performance contracts, the compensation for which varies based on the achievement of the operating goals that have been set. The AMT is responsible for service promotion and development planning of the RTMA. Its own employees also perform the following administrative and legal support activities: accounting (payments, audits, budgets), procurement (calls for tenders), and legal (contracts, legal notices, claims, statements of offence).